Before you read this post I just want to say it is dedicated to Rod Younger of Books4Spain who died suddenly last weekend. A fellow lover of Spain he had an avid interest in Spanish history and especially the Civil War. RIP Rod. “Very few people know what happened here.” This is what an old man said to me whilst staring at his glass of red wine on the bar top. 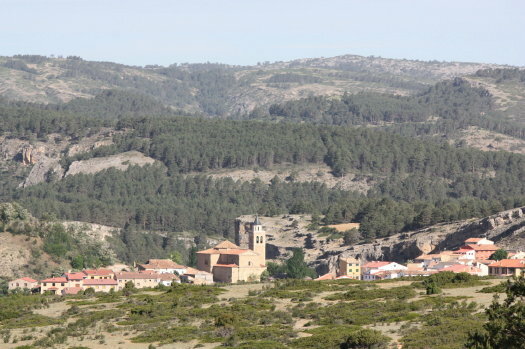 He was referring to the Spanish Civil War and how it affected the villages in the Sierra de Albarracin in Teruel. 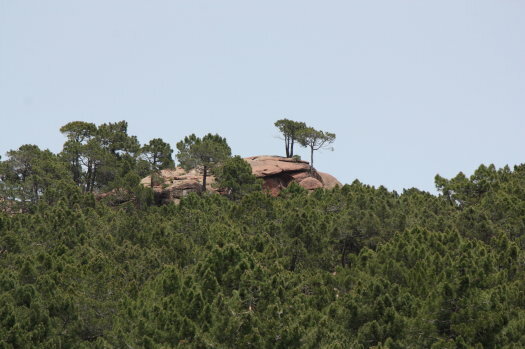 This area not only was the frontier area between the two warring factions of the Republicans and the Nationalists of Franco from 1936 to 1939 but it was also the scene of a lot of Maquis(anti-Franco guerrillas) activities until the late 1940s.This was similar to other sierras in Teruel such as the Sierra de Gudar and of course many parts of Spain. The man had started talking to me,as so often people do in Spain, whilst I was having a glass of beer and a tapa in a very small(and the only) bar in a village, high in the mountains of Teruel. This was about four years ago.He was sitting at the bar and I sort of knew he would start talking to me because of the way he looked at me when I walked into the bar with Julia. And sure enough,Julia went outside to take a phone call and he started. He simply launched into the hardships of mountain life, the cold weather in the winter, the tough deal they had in that area and,eventually, how the Civil War had devastated several villages in the area, physically,socially and psychologically. The main problem was the frontier situation during the war and then after the conflict the presence of the Maquis. Both situations meant that the villages which in general were small,very rural and peace-loving suffered badly as they physically changed hands sometimes two or three times.This beautiful mountain area was and still is a cattle rearing(mainly sheep) community. 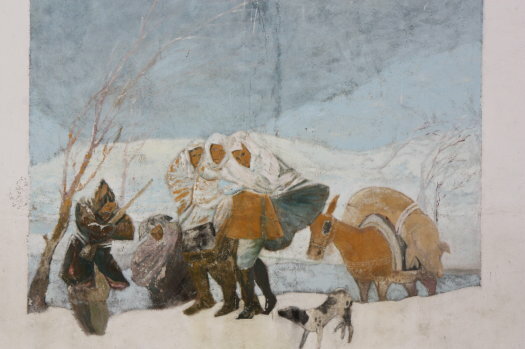 Everyone has sheep or does something related to animals.The changing of hands of the villages resulted in two things: the villagers who supported either side got killed and their property was destroyed or taken away. Both sides committed atrocities with people being shot without trial in virtually every village and by both sides.And because the Maquis continued their activities in the pine tree covered mountains around this sierra then further atrocities were committed for years after the war had finished in order to try to stamp out support for the guerrillas. Reading some of the accounts,one gets the impression that these rural communities lost in the wilds of these mountains were not political at all and in most cases the outside forces who descended on them brought hatred and death. In Guadalaviar, for example, the Republican militias (from Teruel/Valencia mainly) came, and had to activiely push/persuade the villagers to help them burn the church.There was no real natural desire to do this in this quiet place. It is also said that they arrived shouting Fascist/Nationalist slogans to see who reacted by supporting these slogans and then carting them off to be executed as supporters of the Nationalists. Then, a few months later they were visited by the Nationalists who more or less did the same or worse, killing anyone who had collaborated with the Republicans and confiscating their property. 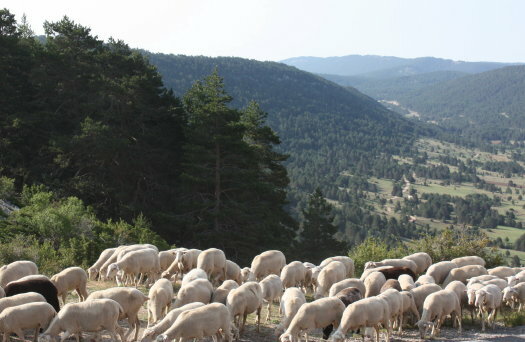 Both sides actively took the villagers’ sheep,chickens etc.The sectarian violence,in general, was imported from other more “sophisticated” areas of Spain. Then,after the war, the presence of the Maquis,hiding out in the rocky and pine tree wilderness brought fresh trouble for the villages of the region as the guerrillas wanted food and visited the villages and were often supported and given food. But they also took food and on some occasions stole whole herds of sheep. Then, of course, the Guardia Civil and special Forest Guards punished villages for helping the Maquis even when they weren’t. In some cases with brutal torturings and killings. If you walk extensively in this area you can find vestiges of the war although I can’t be sure they are all vestiges.They do look very authentic but often there is no record and locals are reticent about talking about those times. The Maquis were bands of Republican fighters who fought on after the war resisting Franco’s government,acting as guerrillas, until the late 40s. They generally sabotaged infrastructure,set up road blocks and robbed the local(normally nationalists) population and killed Guardia Civil or government officials when possible. They had a loosely knit network of groups across rural and wild Spain and in some areas were relatively successful. However, in the Sierra de Albarracin they were eventually eliminated by cruel and brutal methods. They were heroes to many and evil to others but it is true they endured incredible hardship in some of the most beautiful and wild countryside in Spain.The winters in this sierra are particularly cold recording temperatures of down to -30ºC. 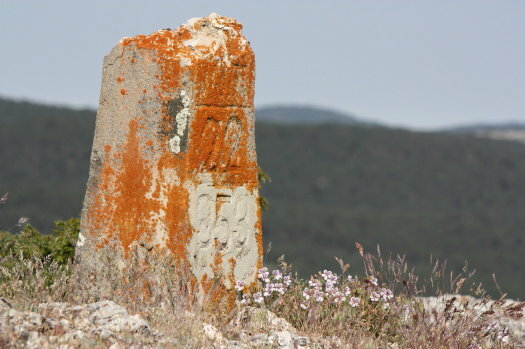 The vestiges of the Maquis can be seen in the Sierra.If you dont mind walking you can visit their secret camps.They make for fascinating visits as they are a mixture of history and nature up in the mountain tops. 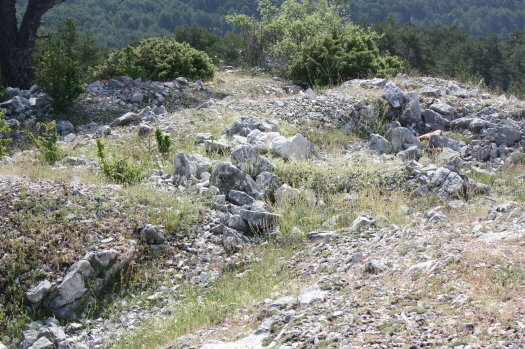 Maquis secret hideouts were hidden in the depths of large pine forests high up in the sierras. 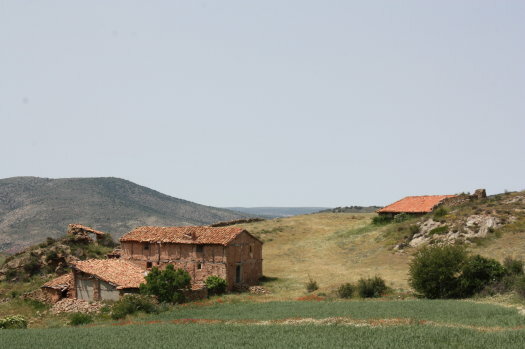 The old man in the bar was right about Griegos,which I have since visited a few times.It is a newly built village compared to neighbouring villages. When I asked him why he knew so much about Griegos and the war he replied, “I am from Griegos,although I live here.I was a very small boy during the war but both my famly and I,unfortunately, remember a lot.” He stared at me with a blank look on his wrinkled face.Then he went back to staring at his glass of wine. I shook hands and left. I often think of that old man when I am walking the mountains near Griegos.. This entry was posted in Spain and tagged Food, history, mountains, pueblo, spanish culture, Teruel, walking by Paddy Waller. Bookmark the permalink. Great post – hugely informative, entertaining and sad. Emotive post, Paddy, nicely done! Good article. That old man witnessed the horror of a civil war that nobody in the town wanted. They were too busy with the business of making a living and surviving Spain’s coldest temperatures. amazing sense of place and the ghosts of history! As you know I am quite fascinated by the Civil War and, in particular, how “normal” life continued whether that be football, transport, education etc. It was a time when the next stranger you met my shoot you, and you over to your opposing forces or give you his last shilling if you were down to your last penny. Whilst I see no justification for war at any stage, a civil war just beggars belief. Who could possibly “win”? The history of Spain in the 30s and for many years after says, “There is NO victor in a civil war”. Rod’s last Twitter DM to me was to tell me that he had just found out that he was “directly related to Senores de Albarracin” so your recent posts have been very poignant as well as interesting. Paddy, your post reminds me of tale I was told when I was a kid, growing up in Franco’s time, these we hushed up and even in a home environment were whispered, Fear was always present. “That one is Falangista”, “Al marido de esa le fusilaron por rojo, la probre”, “Cuidado con Fulano o Bengano que chiva por cualquier cosa” etc, etc, (sorry but those remarks don’t sound right in English). Even today one just has to scratch just below the surface of any pueblo, and it’s all still there, like a festering wound. I know about it because the producers of the programme used some archive footage taken by my father.